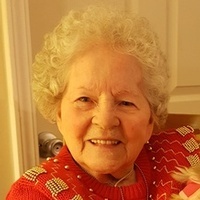 Betty Virginia Roberts, age 89, of Kansas City, Kansas, passed away on Tuesday, December 26, 2017 at Providence Medical Center in Kansas City, Kansas, following a brief illness. Betty was born June 5, 1928 in Atlanta, Georgia to the late Joseph F. Andrews and Exa V. Carnes Andrews. She was an Office Manager for many years for Trailer Services, Inc., retiring in 1979. Betty was a wonderful artist, attending the Kansas City Art Institute. She dedicated her time to sending personalized cards to veterans all around the United States. On February 14, 1979, Betty married Thomas J. Roberts at their home in Kansas City. He preceded her in death in April of 1996. Additionally a sister, Evelyn, has preceded Betty in passing. Survivors include a son, Eugene C. Bryant, Jr., and wife, Debra, of Stockbridge, Georgia; daughter, Shirley Anita Scott of Edwardsville, Kansas; grandchildren, Sara Gasaway and husband, David, Seaton Elizabeth Gwinn, Kimberly Stiles and Christopher Sole; great grandchildren, Tyler Sole, Whitney Stiles, Hollyn, Layla and Dylan Gwinn, Kilissa Gasaway and Kylie Gasaway. Funeral services will be held Tuesday, January 2, 2018 at 11:00 a.m. at Parker Mortuary.